On the weekend, while I was supposed to be cleaning and organising my studio, I got kinda distracted. Thankfully for you and me, I decided to make something rather cute AND functional, and took photos to share! 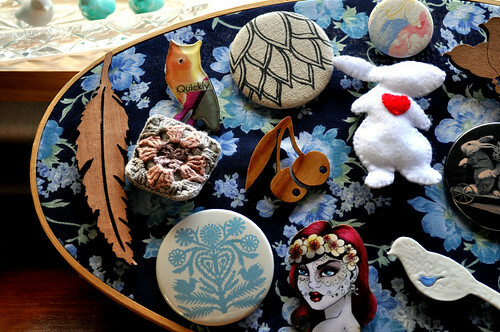 I have a growing brooch collection, and usually they’re just stuffed away in a little purse. But they’re so cute! I want to be able to see them all the time – and keep them nice and organised. So when this idea came to me, I dropped everything and made it. Oh, and because I’m a nerd, I’m going to break this down using the scientific method. 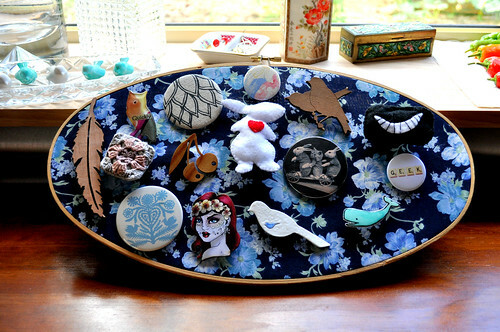 Brooches are cute and awesome. But when they’re hidden away it makes me sad. 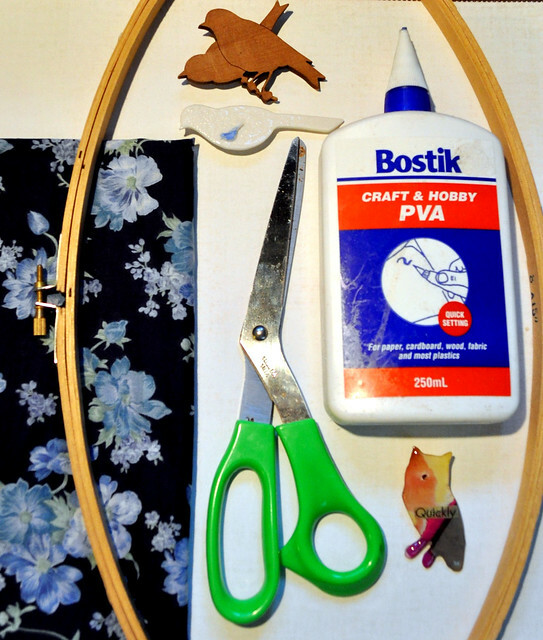 I hypothesise that making a sweet holder for all my brooches using an embroidery hoop and some fabric I have lying around will make me happy and look groovy! 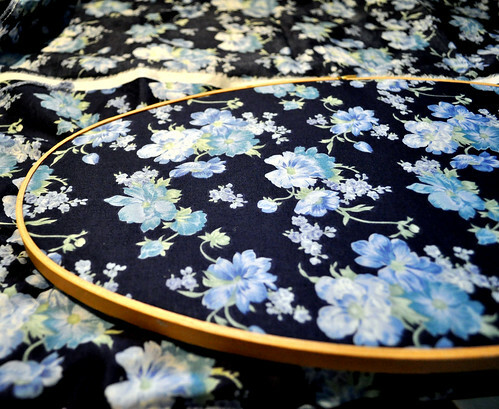 Fabric – I believe this is one of the fabrics my friend Dannielle Cresp gave me! That’s it – pretty gosh-darn simple. 1. 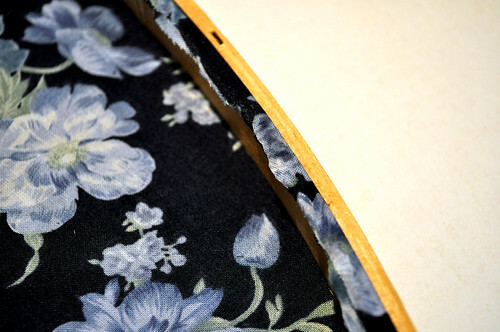 Make sure you have enough fabric to double it over before putting it into your embroidery hoop. Remember, you’re going to be sticking brooch backs through this over and over again (because you wear them a lot) and it needs to be strong enough to stay in one piece. Double or even triple-layer fabric is a must. 2. 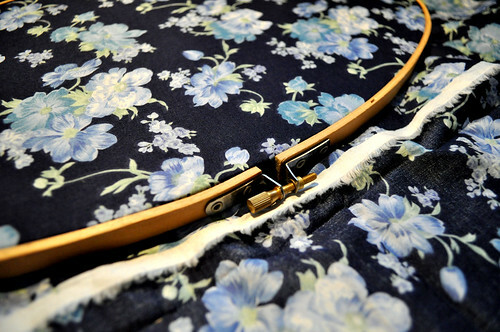 Tighten your embroidery hoop and gently pull the fabric tight. Make sure to flip it over and check both sides. 3. Get ye some glue. Put it all the way around the underside of the hoop, where the fabric comes out. 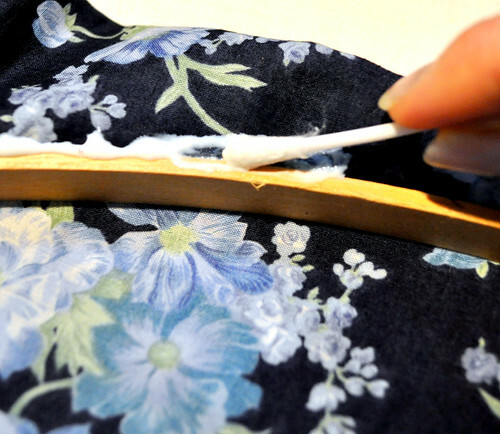 Use a cotton tip to smoosh the glue into the fabric, all the way around. 4. 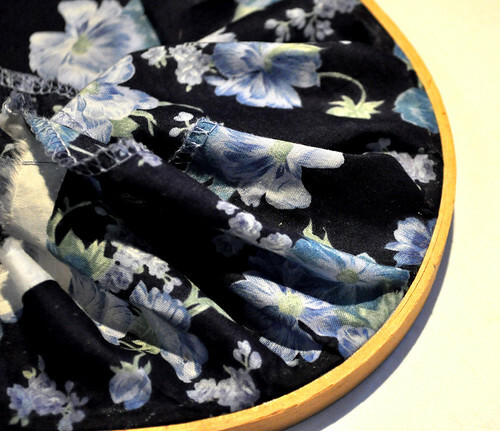 Fold the fabric over the back to the inside of the hoop, then go all the way around again with your cotton tip, pressing the fabric down onto the inside hoop. Leave to dry for at least 5-10 minutes. Or until your glue is not smooshy any more. 5. Use your snissors (okay, okay, scissors) to cut away the excess fabric. If you’re making this as a gift, please do a better job than I did! Leave for a few hours for the glue to set fully. 6. Go crazy with le brooches! Use to adorn the top of your dresser! Or perhaps the back of a door? Or, if you’re a normal person who lives in a normal house (unlike my shed with it’s groovy corrugated steel walls), hang it on the wall! Hypothesis proven correct – hurrah! And better yet, as my brooch collection expands, I can just make more of these and have a cute little collection going on! What a great idea, ive always looked at those hooops at lincraft with a bit of trepidation; im not an embroider. Now i know what else i can do with them. 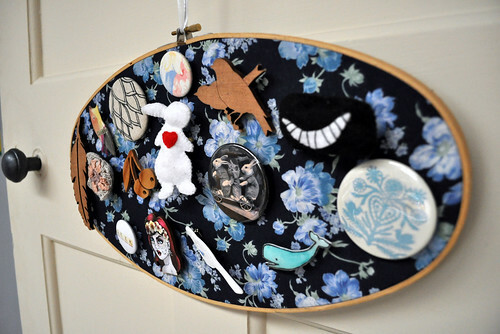 A great project for the school hols… I dont collect brooches (yet) but will think of other adornments for them. ps great fresh layout ! Anyho, the end result looks AWESOME and yes, your brooches are way to lovely to be tucked away unseen somewhere! 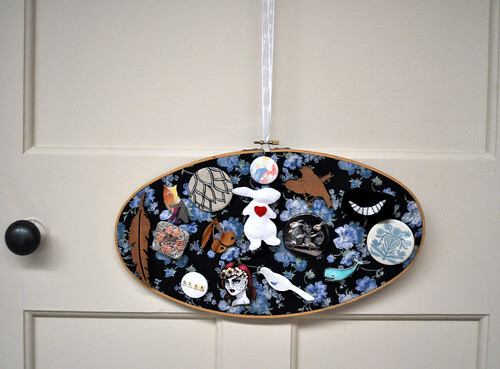 I am so doing this in approximately the time it takes me to find my embroidery hoop collection. What a superb idea! Yay Jess! What a lovely idea and like you I have all the supplies sitting in my cupboard waiting to be scientifically converted into a brooch frame. Thank-you so much for sharing such a simple and lovely project.